My cell phone stores a collection of photographs from last year’s bloody bear hunt in Florida. I can’t help but notice how similar a bear’s beautiful nose is to the noses of our rescued canines who reside in our homes. It’s the same shaped snout, pointing upward, while the bears’ eyes are closed as if asleep. In one such photo of the carnage, the sun is illuminating each individual hair of a mother bear and her cub lying on the back bed of a pickup truck with their arms outstretched toward each other in death, almost as if they were still alive, in their forest glade, feeling the sun warm on their backs and the shady breezes. But they are not. The myriad of photos from last year’s trophy bear hunt were taken by brave anti-hunt monitors at check-in stations. The monitors were charged with documenting the mass killings. Even while tears streamed down their faces, the monitors continued to document the merciless killings with the hope another hunt wouldn’t be repeated in 2016 after the public saw the heart-wrenching photographs. 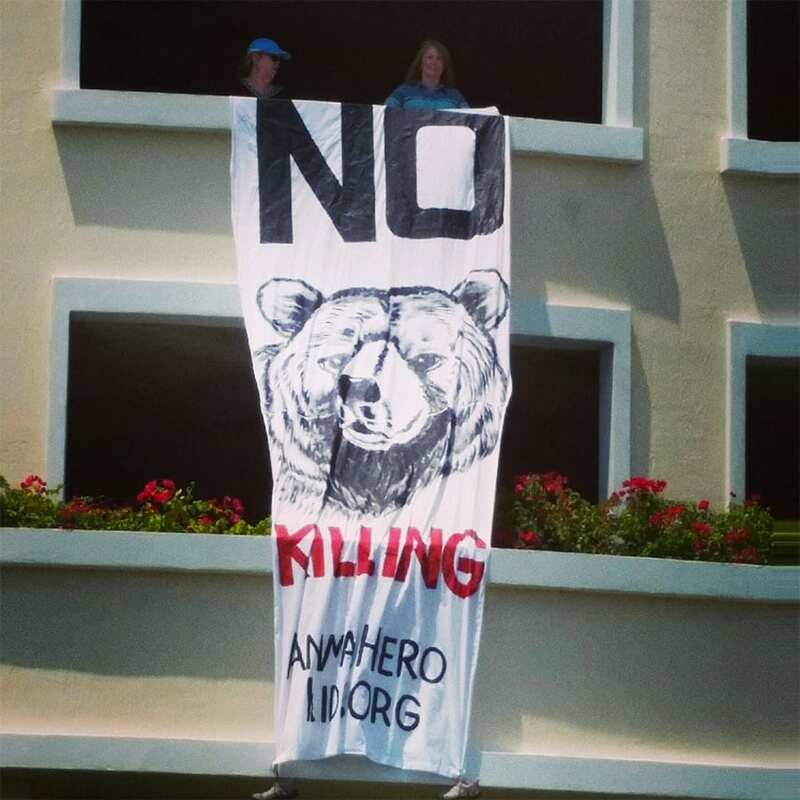 Last weekend I stood in South Beach, Miami, with my “Don’t Kill the Bears” sign in solidarity with compassionate people protesting in 28 Florida cities as part of the “Stop the Florida Bear Hunt” effort. I was reminded, yet again, of how the majority of Floridians, and beyond, are overwhelmingly against trophy hunting. Surely, all of this would add up to ethical, kind, and respectful treatment of Florida’s remaining black bear families? Let’s look at the people making the life or death decisions for Florida’s native wildlife. Florida Fish and Wildlife Conservation Commission (FWC) is composed of a governor-appointed group, who happen to be hunters. The board does not have to, and typically definitely does not, respect or even react to the will of the majority of the people. In the 32 years, I have been speaking at and attending FWC meetings on hunting-related issues, the commission voted only once in favor of protecting the animals being discussed. Now, I will have to change that to twice. In a 4-3 vote on June 22nd, option 3 of 4 options was chosen. Option 3 states a revisit to a possible trophy hunt in 2017. It is truly a testament to the work of many activists of all ages, organizers and groups coming together that the bear hunt was cancelled this year. Many caring people will be sleeping a little easier. The fight continues in the war humans wage against animals in factory farms, slaughterhouses, circuses, laboratories and still in forests, yet, this victory spurs on continued action. On June 22nd the Florida Black Bears won because we all came together in a myriad of ways. It is thanks to our focus the young bears who were born this spring will not have their family blown apart this year. There are many other animals who still need your help. Think of your food, entertainment, and clothing choices and consider if any animals may be harmed as a result. Animal Hero Kids Inc. erected an outdoor ad in Burbank, Calif., across from the Warner Bros Studio in the hopes of attracting support for our mission from talk show host Ellen DeGeneres. DeGeneres, a longtime supporter of animal protection causes, has a powerful and influential voice, as well as a huge platform. 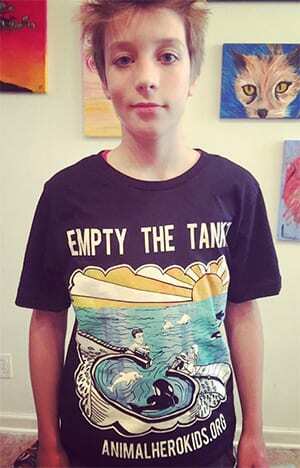 Animal Hero Kids and Teens are speaking up for all species of animals. 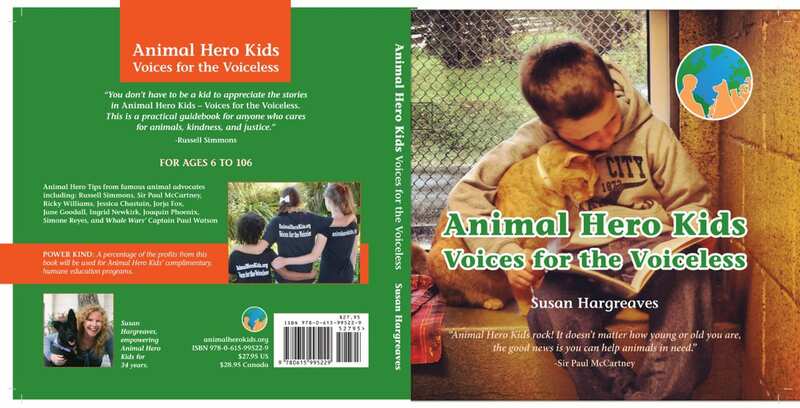 There are some amazing rescue stories chronicled in “Animal Hero Kids Voices for the Voiceless” a guidebook. This book needs to be in each school library, can you go to Ellentv.com and ask her to feature the book’s kind2all mission on her show? As far as Florida’s black bear families go, there will be no more heartbreaking images in 2016. Insert a huge sigh of relief here-I feel encouraged and after 36 years of struggling to help animals, that’s a good thing. -Susan Hargreaves is the author of the award winning Animal Hero Kids Voices for the Voiceless and the founder of animalherokids.org a non-profit empowering, encouraging and recognizing compassionate youth. She is a 36 year veteran of the animal protection movement with a history of wildlife rehabilitating, educating, and organizing against animal abuse. Thank you thank you thank you thank you for your dedication to this cause. You are a true animal hero and deserve a celebration!